While for many Lutherans the term "Lutheran Potluck" conjures up nostalgic images of starchy casseroles and coffee pots, this is not what it will mean in the decades ahead. As we approach the 500th anniversary of the Reformation, the meaning of Lutheran is forecast to undergo great change. "We are not a dying church but we are a changing church," was the resounding message from Presiding Bishop Eaton at this year's ELCA Church-wide Assembly in New Orleans, which two members from our congregation, Adolfo Ramirez and Ellie Sudbrock, attended. What kind of change? For one, according to a recent PEW study, the Evangelical Lutheran Church in America is currently the whitest Protestant church in the United States. That cannot continue to be. While the Lutheranism's roots in Germanic and Northern European culture will always be part of our story, we are entering a new chapter in which we must live out God's call to be fully inclusive and representative of the neighborhoods, cities, countries, and world we live in today. The 21st Century Lutheran Potluck will include a hot dish and Jell-O, plantains and pernil, and things we can't predict based on stereotypes or tradition. The collection of foods at the table will not be a mono-cultural cliché, but rather a representation of the vast variety of cultural identities that God has been urging to come together since the word "Gentile" was the everyday divisive term. This new potluck will paint a picture of a church that is alive and changing. And, contrary to another Lutheran cliché, change is good when it brings us closer to God's vision for how humanity lives and loves together. We're having a 21st Century Lutheran Potluck on Friday, October 14 as part of our Consecration weekend. It will be bilingual, in English and Spanish, and you are invited to bring whatever dish represents you, where you're at in life, your family tradition, your culture, or just whatever sounds delicious. Join us in redefining the Lutheran Potluck. Also, get to know others at Advent in a fun team trivia game, and share your vision for Advent on a "Write the Vision, Make it Plain" graffiti wall! Come join the fun and fellowship with our whole community at our Consecration Potluck. If you know you're coming, RSVP online for the potluck to let us know what type of dish you'll be bringing. As our Call Committee works diligently to find the right person to be our next Senior Pastor, we know an exciting new leader will be joining our congregation. And we'd like to help them get to know who we are. 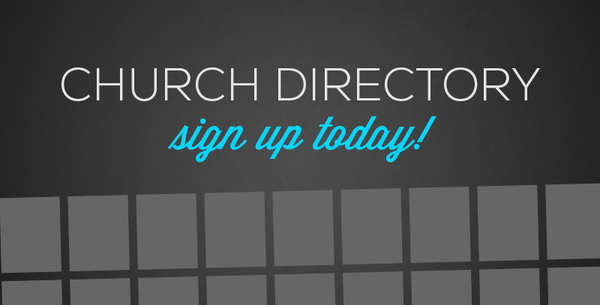 A new directory is not only a powerful resource for all of us, but also an amazing gift to a new pastor. Join us on one of six dates in October and November to get your/your family's portrait taken for our new Advent Members and Friends directory! Getting your professional portrait taken for our directory is free, and you'll also have the option to buy any pictures you like in time for Christmas-card season. Eco-Reformation 4-Week Study | As we near the 500th anniversary of the Reformation, it’s time for an Eco-Reformation! Join us for this four-part study on Eco-Reformation, from 6:30-7:30pm on four Wednesdays: October 5, 12, 26, and November 2. RSVP now to get early access to the study and bonus materials, or drop-in for our first session next Wednesday, October 5. Adult Conversation | Talk about the "Vision of Giving and Growth in Giving" as part of Consecration season. 10:10am in the basement fellowship hall. Sunday Singers | Meets at 10:15am in the sanctuary for rehearsal, and sings at 11am Worship. Contribute to our Mission of the Month this September: The Pastor's Discretionary Fund. This allows our pastors to help with unexpected and particular needs for our congregation and members of our community.